I'd like to learn more about the Viking trade center at Birka. Can you help? Birka sits upon the island of Björkö at the entrance of the Mälar Sea (sometimes called Lake Mälar), not far from the site of modern Stockholm. 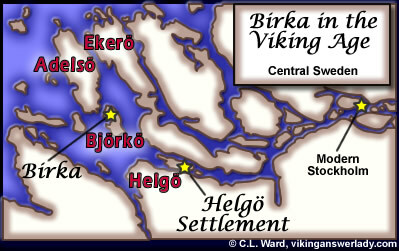 Birka therefore acted as the trade center and gateway for all of Central Sweden. The major east-west trade route passed along the southern Swedish coastline, through Bornholm, Öland, and Gotland, but Birka was the richest trade center of all. Traders came to Birka from Frisia, Anglo-Saxon England, Germany, the Baltic countries, Greeks from Byzantium, and Orientals. A visitor approaching the island of Björkö sees first a bare rock due south of the site of Birka. On this rock was a fortress and a place of refuge if the town were attacked, surrounded by a rampart of earth and stones 25' to 50' across, oval in plan and with three gates: one facing north, one south, and one facing east towards the town. Outside the northern gate was the garrison that manned the fortress. North-east of the northern gate is the modern "Black Earth" area upon which the historical site was situated. Two types of houses were in use at Birka: wattle-and-daub homes, and timber or log houses caulked with clay. The settlement area occupies only 30 acres -- less than half the area of Hedeby. A defensive rampart surrounds the settlement, averaging 22' to 39' wide and 6 feet high. Gaps occurring in the line of the rampart indicate that there were probably square wooden towers along this fortification for further protection as well. About the same time it happened that a certain Swedish king named Anound had been driven from his kingdom, and was an exile among the Danes. Desiring to regain what had once been his kingdom he sought aid of them and promised them that if they would follow him they would be able to secure much treasure. He offered them Birka... because it contained so many rich merchants, and a large amount of goods and money. He promised to lead them to this place where, without loss to their army, they might gain much that they wanted. Enticed by the promised gifts and eager to acquire treasure, to assist him they filled twenty-one ships with men ready for battle and placed them at his disposal, moreover he had eleven of his own ships. These left Denmark and came unexpectedly to the above-mentioned town (quoted in P.H. Sawyer, "The Causes of the Viking Age", pp. 4-5). Birka boasted three harbors in its heyday, an artifical harbor to the west, and two natural ones on the northern coast: Kugghamn ("Cog-haven", after the Frisian sailing vessel called a "cog") and Korshamn ("cross-haven", probably originally Kornhamn or "corn-haven") in the east. Still further east, near a smaller town named Salvik (lit. "the place of sale and trade") was a shallower harbor for smaller boats with a shallow draft. One of the rich sources of information about Viking Age Birka comes from the many burial sites on the island. East of the rampart, outside the town, are some 1600 grave mounds, large and small, beneath the shade of pine and birch. There are other cemetaries as well, one small one between the town and the hilltop fort, perhaps used for the warriors guarding the town? Further east across the island are isolated graves, some without mounds but made of timbered chambers -- these have been located only because of subsidence revealing their location centuries later. Since these graves are often extremely rich, one suspects that these graves were deliberately made without mounds to hide their location and hence to foil would-be grave-robbers. The burials show clear traces of two separate traditions. The first group of burials are related to Swedish Viking Age burials elsewhere, with cremation layers under grave-mounds, or occasionally boat-shaped stone enclosures. The second type of burials have a foreign influence, scholars think, with inhumation in coffins and chamber graves, found on the edges of town. It is thought that these graves were those of foreign merchants and craftsmen and their families, perhaps Christians or Moslems, or may be converts to Christianity from the local area. Certain of these are believed to be Christian interrments, based on the lack of grave-goods and the occasional presence of small crosses. Indeed, the Christian Cross and the Hammer of Þórr are often found in the same grave, as though to secure the favor of both gods. Another type of religious amulet found at Birka were small miniature chairs or thrones with rounded backs, some attached as pendants to necklaces. It could be that they have nothing more than ornamental significance, but many scholars assume a symbolic function in representing thrones or high seats within the pagan context, relating these to the High Seat of Óðinn, or to Hrothgar's gifstol in Beowulf . The Scandinavian-influenced graves are of a wide variety of types: rich and filled with grave-goods, others poor; inhumation burials and cremation graves. In the large burial chambers where the dead were not cremated the corpses are usually men, and they were laid there with their weapons, riding gear, food and drink, horse and dog -- and sometimes with a woman as well, a wife or a serf. On the other hand, most of the women's graves from Birka were inhumation burials with simple wooden coffins. Trade came northwards from the German and Frankish lands, through the hands of Frisian traders on the Holland coasts. The trade came northwards through the Zuider Zee, through the Frisian Islands, to the mouth of the Eider River on the lower Jutland Peninsula. From here trade crossed the Danish isthmus to reach Hedeby on the Baltic side. Then the traders turned northwards along the Swedish coastline to Birka. Along the path northwards, traders stopped at a number of bjorkeys, primitive trade centers located at the head of fjords and other waterways. The bjorkeys were trading spots where goods were gathered for shipment down the coasts to more important commercial centers. Gotland was also a trade point, but archaeological remains suggest that Gotland was perhaps the site of trade fairs held at regular intervals rather than being a permanent trade town such as Hedeby or Birka. Birka was one of the first true urban centers of the North, called portum regni ipsorum qui Birca dicitur by Rimbert in the 9th century. Attempts have been made to calculate Birka's population on the basis of the number of graves. The conclusions vary between 500 and 1,000 inhabitants, but the population was certainly large. The graves also reveal marked social stratification, typical of a large population and important urban center. Some scholars have speculated that the major trading season at Birka was during the winter, because the finest furs would be available then and because many of those found in Birka burials have crampons for walking in ice and snow affixed to their feet. This ignores the fact that more people die in winter than in summer demographically the world over, and also ignores possible religious belief that describes the land of Hel, where the dead dwell, as a cold and icy realm. Ice skates made of cow bone and ice axes are also common finds at Birka. It seems more likely that the market at Birka operated year-round, dealing in agricultural wares during the late summer and early fall, in furs during the winter, and luxury goods imported from the world over all year round. Trade items reaching Birka originated at far distant locations. Birka was best-known for its furs, obtained by trade and coercian from the Lapps, Finns, and from Russia. Fine fur cloaks of bear, fox, marten, otter, and beaver have been found in Birkan graves. Birka grave sites reveal Rhineland pottery, glass, metalware, and pallia fresonica (a type of elaborate cloak), as well as textiles from the Middle East and the Orient including Chinese silk, Byzantine embroidery in extremely fine gold thread, passementerie, heavy gold brocades, and plaited cords of the finest quality. Some of the brocades were imported, while others are clearly Scandinavian and of equally fine quality. Birka and Hedeby are the only two Scandinavian locations where high-quality pottery has been found. Some pottery was imported from the Rhineland, some from Finland, but some was produced locally in Birka. Other Scandinavian wares were traded at Birka, including reindeer antler and items made of antler such as hand-carved combs, walrus teeth, amber, and honey from southern Sweden. Coins reaching Birka include gold Frisian solidi and Arabic Samanid silver coins, but interestingly enough it is very rare indeed to find Anglo-Saxon or Carolingian coins minted after 840. Scandinavian-minted coins begin to appear as far back as the ninth century. Ansgar's biography tells us that Birka was ruled by a council rather than by royal decree. When Ansgar came to Birka, he approached King Olaf, who thought it necessary to cast lots to ascertain the opinion of the gods, and to obtain the opinion of the people at the Thing, "for it is the custom of that country that every public concern depends more on the people's uniform will than on the power of the king." This is not to say that the Swedish king lacked power over Birka. King Olaf declined to simply issue an edict in the matter, because there had recently been a pagan backlash following recent attempts at a Christian mission: Olaf himself is said to have favored Christianity. He first gathered his chieftains and debated with them about Ansgar's mission, then they went into a field and threw lots which revealed that the gods indicated that they should accept Christianity. On the day the Thing assembled the king had the matter proclaimed by a herald. First it aroused opposition, but after a man pointed out the value of the Christian God as a protector on the hazardous journeys to Dorestad, the large Frisian trading town, the Thing agreed to the king's desire. Birka was situated at the border of three different herreds, "hundreds" or administrative districts, so it would have to have some degree of self-rule, or else face conflicts between the laws of the neighboring herreds, Södermanland law, Vastmanland law, or Uppland law. Birka is situated on the old royal estate-land, and was reachable only by passing through royal-owned waterways, and hence was under the direct protection of the Swedish king at Old Uppsala. Rimbert also tells us in Vita Anskarii that Birka had its own praefectus, a representative for the king who attended the thing-meetings. The laws in Birka would have been maintained and upheld by the Birka Thing, under the leadership of a prefect/lawspeaker/goði. These laws were termed the Bjarkeyjar rettr, the Law of Björkö, and is the oldest urban law codified in Scandinavia. According to Rimbert the laws further distinguished between the negotiatores (the foreign tradesmen) and the populi (the permanent inhabitants). An important source of information about Birka in the early 800's comes from Rimbert's Vita Anskari (the Life of Ansgar ) the account of the Benedictine brother Ansgar's mission to pagan Sweden. Ansgar visited Birka twice, once in 829, and again in 850 or 852. Another useful account is King Alfred the Great's account in Old English, garnered from the trader Wulfstan, describing the Baltic trade route and specifically telling of Hedeby. Adam of Bremen, though writing 200 years later and from second-hand accounts, has much to say about Birka, and specifically about the Swedish people and their culture. Ansgar's first visit to Birka was nearly his end, as he reached the trading town only after having been attacked by pirates or Vikings enroute. King Björn gave Ansgar a warm reception, and permitted to him to build a church. During the two years that Ansgar was resident in Birka, the Swedish church was incorporated into the Roman ecclesiastical system, and Ansgar was eventually made bishop of Hamburg, with the rights of jurisdiction over the Birka community. The "rights" this conferred, however, were nothing but mere formalities; the Birka 'church' was weak and no serious impact was made on the surrounding pagan culture. Ansgar revisited Birka in the middle of the century, but still had little impact on pagan Birka and Sweden. There are no examples from Birka of the coins of the English King Æthelred II, common elsewhere in Sweden, in which the last substantial amounts of Danegeld were paid; and indeed no coins minted after the middle of the century have been found in the graves. The latest datable find is a hoard of silver, discovered in the 'Black Earth', in which no coin is later than 963 or 967. It has been assumed, though there is no certainty, that Birka was destroyed by the Danish forces which set out to conquer Sweden at the end of the tenth century but were defeated by King Eric the Victorious at the great battle of Fyrisvold described on the rune-stones. Whether this was so or not, Birka drops out of history about 975; its function as the centre of the Baltic trade was taken over by Gotland, and the more local trade of Lake Mälar was divided among several other places on the lake: principally Sigtuna, halfway between Birka and Uppsala (Brøndsted, The Vikings , p. 163). Sigtuna, a little to the north of Birka on the way to Uppsala, presumably succeeded Birka, and there may have been a period of overlap during which both towns served as trade-centers. Sigtuna was certainly closely connected with the king and coins were minted there around AD 1000. The cause of Birka's fall is not known with any certainty. Other theories suggest that it may have been that the land level rose, thus blocking access to the sea at Södertälje, or that the area's economy changed as opportunities for obtaining Arab silver in the East declined. 800 King Alrik, son of King Eirik of Uppsala, rules over Vastergotland in Sweden. 806 Hedeby begins to be mentioned as a great portus or center of trade. 810 King Godfred of Denmark is murdered while trying to conquer Charlemagne's Frisian coastal holdings. 810-11 Hemming, Godfred's nephew, becomes ruler in Denmark but lives only a year. Hemming managed to negotiate a peace treaty with Charlemagne before he dies. 811 King Horik Godfredsson takes over the rule of Denmark, including Hedeby. Harald Haraldson, called Klak also claims the title of King of Denmark. 815 Charlemagne's son, Louis the Pious, begins a campaign into Danish Jutland. 826 Harald Klak adopts Christianity to gain the support of Charlemagne. In the words of the Vita Hludovici , he and 400 of his followers were "drenched in the wave of holy baptism." Harald is accompanied by the Benedictine missionary, Ansgar as he returns to Denmark with the emperor's blessing. 827 Harald Klak driven out of Denmark for good, given a fief in Frisia by the Franks. 829 The first Christian missionary arrives in Sweden, the Benedictine brother, Ansgar, accompanied by a helper, Witmar. They are attacked by vikings, lost their holy books, and finally arrive in Birka on foot and penniless. Birka is mentioned as an urbus or great city in the Vita Anskari ( The Life of Ansgar ). King Horik of Denmark, although himself a pagan, was instrumental in arranging Ansgar's mission as a diplomatic maneuver to ensure trade with his Christian neighbors. King Bjorn is the ruler of Sweden at this time, living in Old Uppsala, and makes Ansgar welcome if only to avoid antagonizing Louis the Pious. 829-31 King Bjorn allows Ansgar to build a church in Birka, where he was the minister. Ansgar converts Hergeir, the prefect of Birka. Hergeir donates the land for the church and becomes a staunch Christian. 831 Ansgar was made bishop of Hamburg, with ecclesiastical jurisdiction over Birka. Pope Gregory IV names him, jointly with Ebo of Rheims, papal legate to all the Northern Peoples, including the Swedes, Danes, and Slavs. Little or no impact was made on the pagan belief in Birka at this time. late 800's Gautbert is appointed as missionary to Birka. His mission is moderately successful for a while, until suddenly the pagans become angry and kill Gautbert's companion Nithard and expel Gautbert from Birka. 840 Louis the Pious dies, marking the beginning of political, economic and social upheaval in the Frankish Empire. 843 The Frankish Empire is divided among Louis's three sons, the east going to Louis the German, the West to Charles the Bald, and the center to Lothar. 845 The Danes sack Hamburg with a fleet of 600 ships. 850 Ansgar's second visit to Birka. The fierce Swedish king Olaf rules in Sweden during his second visit. The converted prefect, Hergeir, dies. Ansgar leaves the missionary Erimbert in Birka when he leaves. King Horik of Denmark gives Ansgar permission to build a church at Hedeby. 850 Ansgar sends a new mission to Birka. He sends the hermit Ardgar to meet with Hergeir, the converted Christian prefect of Birka. It is uncertain where these coins were produced. Some say Birka, others name Jumne in Wendland or Hedeby in Denmark. Hedeby seems most likely, being closest to Dorestad. 853 King Horik of Denmark is killed with all his family, except his youngest son, also named Horik. Horik the Younger is under pressure to close the church in Hedeby, which he does. 854 Political and economic considerations lead Horik the Younger to order the Hedeby church reopened. In a scandalous move, the church is allowed a bell and further allowed to ring the bell, which had hitherto been scandalous to the pagans living there. 854 The Viking Rurik gains a stronghold at the neck of the Jutland peninsula, in effect becoming a "robber baron" able to exact "taxes" on all trade moving from Frisia towards Hedeby and Birka. This Rurik is probably a brother of Harald Klak. 873 Denmark has two kings, the brothers Sigfred and Halfdan. 891 Two Danish kings, Sigfred and Godfred, are killed. 930 A mission to Birka is dispatched from Hamburg under Archbishop Unni. Again, Christianity fails to make any impact and pagan belief prevails. 950 Birkan trade with Russia drops off sharply. No Samanid silver minted later than 960 is found anywhere in the Baltic. ca. 950 The Arab merchant Al-Tartushi gives his account of a visit to Hedeby. 960 Lake Mälar's water level begins to drop, making the waterway that communicates with Birka more and more shallow. 970 Gotland has grown up from a seasonal trade fair to a thriving center of trade, and begins to capture trade formerly belonging to Birka due to its better location on the Baltic trade route. 975 Birka suddenly ceases to exist. No reason has been discovered for its abrubt demise, though the changes from 950 on probably all contributed. The trade which formerly went through Birka moves to Sigtuna, somewhat nearer to the capital at Uppsala. 994-1022 Reign of the Swedish King Olaf Skotkonung. During his reign, Olaf minted native Swedish coinage based on Anglo-Saxon coins. 1022-1050 Reign of the Swedish King Onund Jacob. King Onund also minted his own coins, again based on Anglo-Saxon examples. 1050 Hedeby perishes in a conflict between King Harald Hardrada and King Swein Estridsson of Denmark. The town was raided by Harald and burned to the ground. 1075 Adam of Bremen describes the geography and peoples of Scandinavia, the town of Birka, and the temple at Old Uppsala in his Gesta Hammaburgensis Ecclesiae Pontificum . Ågren, Torbjörn. "Fur in Birka: an Examination of Hair Residue on Penannular Brooches". Laborativ Arkeologi 8 (1995) pp 50-58. Ambrosiani, Björn. Birka on the Isle of Björkö: Cultural Monuments in Sweden . Stockholm: Riksantikvarieämbetet. 1988. Ambrosiani, Björn. "Birka." Medieval Scandinavia: An Encyclopedia . Garland Reference Library of the Humanities 934. New York: Garland Publishing. 1993. Ambrosiani, Kristina. Viking Age Combs, Comb Making and Comb Makers in the Light of Finds from Birka and Ribe . Stockholm Studies in Archaeology 2. 1981. Bauer, Nina. Birka vikingastaden (Birka - the Viking Town). Accessed 2 September 2000. Blindheim, Charlotte. "The Emergence of Urban Communities in Viking Age Scandinavia." In: The Vikings . R.T. Farrell, ed. London: Phillimore. 1982. pp. 42-69. Brøndsted, Johannes. The Vikings . New York: Penguin. 1965. Clarke, Helen and Björn Ambrosiani. Towns in the Viking Age . London & New York: Leicester University Press. 1991. rev. 1995. Cramp, Rosemary. "The Viking Image." In: The Vikings . R.T. Farrell, ed. London: Phillimore. 1982. pp. 8-19. Gräslund, Ann-Sofie. The Burial Customs: A Study of the Graves on Björkö . Birka 4. Stockholm: Kungl. Vitterhets Historie och Antikvitets Akademien. 1980. Hägg, Inga. Kvinnodräkten i Birka: Livplaggens Rekonstruktion på Grundval av det Arkeologiska Materialet ( Women's Clothing at Birka: Garment Reconstructions on the Basis of the Archaeological Materials ). Uppsala: Institut for Arkeologi. 1974. Hoffman, Olle and Therese Lindstrom. The Town/Trading Place/Harbour of Birka. Viking Heritage Website. Accessed 2 September 2000. Hoven, Bengt E. "Ninth Century Dirhem Hordes from Sweden." Journal of Baltic Studies . 13:3 (1982) pp. 202-219. Jones, Gwyn. A History of the Vikings . 2nd ed. Oxford: Oxford Univ. Press. 1984. Lewis, Archibald R. The Northern Seas: Shipping and Commerce in Northern Europe, A.D. 300-1100 . New York: Octagon Books. 1958, repr. 1978. Lindquist, Sven-Olof. Society and Trade in the Baltic During the Viking Age . Acta Visbeyensia 7. Visby: Gotlandsfornsal. 1985. Liquid Media. Birka och Vikingarna - Internet (Birka and the Vikings - Internet).Accessed 2 September 2000. Noonan, Thomas S. "Ninth Century Dirhem Hordes from NW Russia and the SE Baltic." Journal of Baltic Studies . 13:3 (1982) pp. 220-224. Nordling, Carl O. "The location of the Birca - the Missionary Station of Bishop Ansgar." Scandinavian Journal of History 23 (1998) pp. 89-106. Philip, Mats and Björn Axelsson. Birka at the Silkroad!. Accessed 2 September 2000. Pritsak, Omelian "The Perspective of the Slavs, Finns, and Balts." Journal of Baltic Studies . 13:3 (1982) pp. 185-201. Rimbert. Vita Anskarii . In: Anskar, The Apostle of the North, 801-865, translated from the Vita Anskarii by Bishop Rimbert his fellow missionary and sucessor . Charles H. Robinson, trans. London: SPCK. 1921. Roesdahl, Else. The Vikings . trans. Susan Margeson. Harmondsworth: Penguin. 1987. Samson, Russ, ed. Social Approaches to Viking Studies . Glasgow: Cruithne Press. 1991. Sawyer, Peter et al. "Relations Between Scandinavia and the Southeastern Baltic / Northwestern Russia in the Viking Age." Journal of Baltic Studies . 13:3 (1982) pp. 175-295. Sawyer, Peter. "The Viking Perspective." Journal of Baltic Studies . 13:3 (1982) pp. 177-184. Sawyer, Peter. "The Causes of the Viking Age." in: The Vikings . R.T. Farrell, ed. London: Phillimore. 1982. pp. 1-7. Sawyer, Peter. "Birka, the Baltic and Beyond."." in: Society and Trade in the Baltic During the Viking Age . Sven-Olof Lindquist, ed. Acta Visbeyensia 7. Visby: Gotlandsfornsal. 1985. Stalsberg, Anne. "Scandinavian Relations with Northwestern Russia During the Viking Age and the Archaeological Evidence." Journal of Baltic Studies . 13:3 (1982) pp. 267-295. Tuukka, Talvio. "Finland's Place in Viking Age Relations Between Sweden and the Eastern Baltic/Northern Russia: the Numismatic Evidence." Journal of Baltic Studies . 13:3 (1982) pp. 245-255. Waller, Jutta. "Swedish Contacts with the East Baltic in PreViking and Early Viking Ages: the Evidence from Helgo." Journal of Baltic Studies . 13:3 (1982) pp. 256-266. Page designed by Christie Ward (Gunnvôr silfrahárr).